Ms. Licata joined the firm in 2017 following a successful civil clerkship with the Honorable Estela M. De La Cruz, of the New Jersey Superior Court in Bergen County. During her clerkship, Ms. Licata was responsible for reviewing motions, writing bench memoranda, researching legal issues and drafting legal opinions. Ms. Licata also served as a court-trained mediator, assisting parties in the settlement of Special Civil and Law Division cases. A graduate of Seton Hall University School of Law, Ms. Licata served as the Symposium Editor of the Seton Hall Circuit Review during her final year. Ms. Licata received several scholarships including the Chancellor Scholarship, the Peter W. Rodino, Jr. Scholarship and the Mary Franzese Humanitarian Scholarship. Additionally, Ms. Licata was a legal intern for Seton Hall’s Immigrants’ Rights/International Human Rights Clinic. In her Appellate Advocacy program, Ms. Licata received the Best Oral Advocate distinction and also served as the co-President of the Rodino Society. 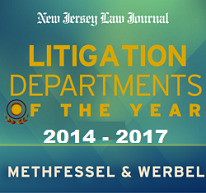 Ms. Licata is a member of Methfessel & Werbel’s Insurance Coverage Practice Group under the direction of Marc Dembling and Gina Stanziale.